Technology is changing everything, from the way we eat and drive, to how we communicate and work. The “digitalization of everything” is changing how we work and therefore the skills we need to do our work. Brookings produced a study in late 2017 that is highlighted below and here is a link to the full study. Necessary Skills - Digital skills are becoming a requirement for getting a job, almost on the same level as a degree or any other standard qualification. You don’t need to be an expert coder (yet), but for most jobs, being proficient in excel is a necessity. 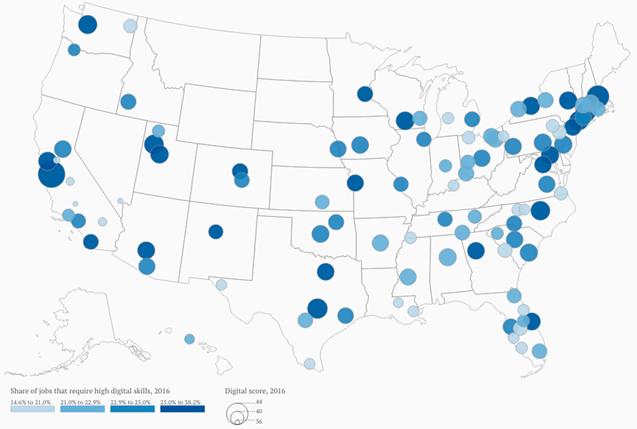 Wages – High-level digital jobs wages have gone up, and the mean salary sits just under $73,000/year. These will continue to rise. One interesting finding is that low-level digital jobs have seen a decrease in wages down to $30,393/year. Why? Automation – Robots are taking the tasks typically performed by employees. 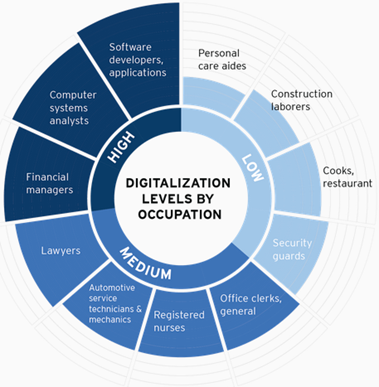 For those entering the digital workforce, or trying to move within the workforce, developing some quality digital skills is the one way to ensure job security and stay one step ahead of automation. What is certain is the ability to start a career in an industry and stay there for three decades (like I have in brokerage) will be increasingly hard to do. Today, continuing to grow, learn new skills, and be comfortable being uncomfortable are all critical for your future.